I was a little disappointed in these muffins. The taste was, don't get me wrong, wonderful. The sprinkling of turbinado sugar on top added to the sweetness and gave these an almost dessert-like quality. Two tablespoons distributed evenly among the 12 muffin cups was suggested, but I think one would suffice. The recipe adds plain yogurt to the batter, and that gives the muffins a slight tanginess, barely noticeable but an interesting undertone. And fresh out of the oven, these muffins are warm, moist, and great for breakfast or even with a big bowl of soup or chili. My problem with these muffins was the texture. Leftovers did not fare too well, as they got hard, dry, and crumbly. Sure, that can be expected from cornbread, but I've had cornbread that stayed moist and cake-like days after baking. What happened with these? The recipe also suggest that these can be kept for days in the fridge in an airtight container; still, that didn't seem to make any difference. Make again? 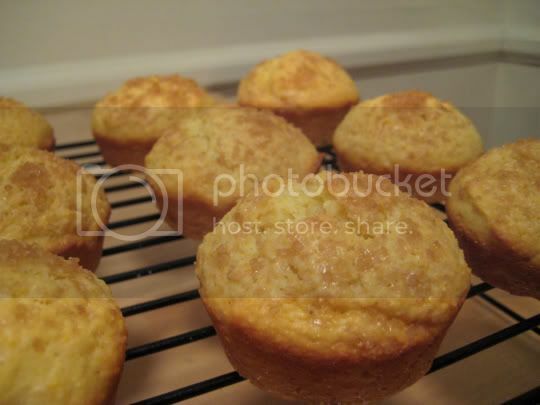 Probably not, there are much better corn muffin recipes out there.